To synchronize contacts obtained through email and record them in Salesforce, open the app.zynbit.com URL. Choose the ZynSync icon from the left column on main page. The first time you connect, you will be prompted to connect to Salesforce and also authenticate with your email account. Connect your email inbox to the Zynsync account by clicking the green Add New Mailbox button on the right. 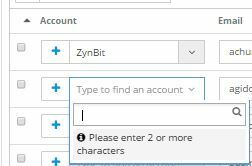 This tab displays Email senders which have been found in the ZynSync users’ email InBox but are not in Salesforce. This allows the user to ensure that Salesforce records are created for new contacts quickly and efficiently. 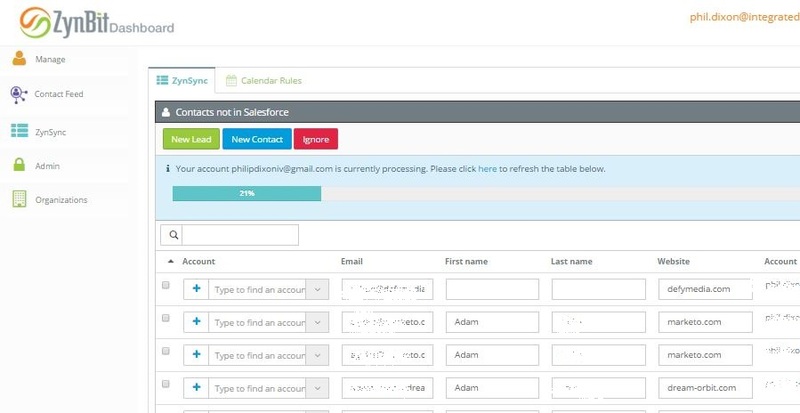 To add the Email sender as a Salesforce Contact, search for the Account record in the far left column and then check the box to the left of the record. Note: Leads are not associated with Accounts in Salesforce, therefore you can simply enter the Contact’s Company Name without verifying its existence in Salesforce. Click the New Lead or New Contact button when any additional data has been recorded, as appropriate. You can create multiple contacts or leads by selecting the checkbox for multiple records. Once multiple records have been created, click New Lead or New Contact. As long as required fields are complete, your new leads and contacts will be uploaded directly to Salesforce.